Year One is an uneven episodic comedy, goofily charming at times, cringe-worthy at others. It stars Jack Black and Michael Cera as pre-historic guys who get thrown out of their small tribe (for eating forbidden fruit, no less) and, in their subsequent wanderings, interact with various Old Testament figures. There’s Paul Rudd and David Cross as Cain and Able, Hank Azaria as Abraham (about to sacrifice his son, Christopher Mintz-Plasse, who plays him as a sort of Biblical-times McLovin), and (an unfortunate) Oliver Platt as an oily priest of Sodom. There are funny actors here, but they aren’t given much that’s inherently funny. When they succeed, it is through likability and talent. When they fail, they’re given the benefit of the doubt. Surely it wouldn’t be their fault, right? The movie goes down easily enough. It’s occasionally funny, but it’s never a funny movie; its structure wouldn’t support it. In its construction, in its characterization, in its every line, it’s so ramshackle and misguided. It plays like a mediocre series of recurring sketches on Saturday Night Live (see: MacGruber) strung together (and out) to feature length. It’s clunky and episodic and every five to ten minutes I was wishing it would move on to another moment. There’s some novelty to the experience. Jack Black and Michael Cera don’t break any new ground for themselves in the acting department but that’s part of the initial fun, at least, to see the boisterous-Black and stuttering-Cera types exhibited by cave-people. The idea wears out its welcome fairly quickly though, leaving two grating performers stumbling through backlot sets amid indifferent extras. It’s directed by Harold Ramis, and, while this is certainly no Groundhog Day, he seems to be able to find funny moments within the performances in otherwise bland material. There were times when I surprised myself by chuckling, but it was no more surprising than the times that I cringed. It’s a little sad to watch a comedy and have it give such a feeling of indifference that any reaction is surprising. The movie wheezes through its structure, laboriously setting up jokes (or worse yet, running jokes) that are barely humorous and introducing characters and concepts that are only worth a smile at the most. It didn’t stir up hatred within me, and it’s not unpleasant, but I’m sure it’s a movie that would play better if it was on late-night TV when I'm half-asleep. Despite being based on a line of action figures and a terrible 80s animated series, Transformers was a fast, fun summer movie with satisfying human comedy, a good grasp on its goofy tone, and cool special effects, even if the last twenty minutes devolved into a mess of incomprehensibility. 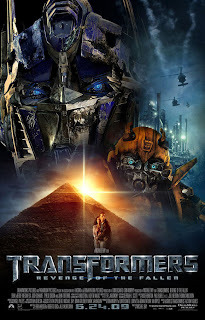 With Transformers: Revenge of the Fallen, Michael Bay has created a film that expands every aspect of his first film, a move that destroys the precarious balance of the comedy, loses sight of the inherent goofiness of the concept, and uses its special effects so often that they become numbing. Not even an intense booming explosion that resonates with a deep bass kick in the climax of the movie could shake me out of my bludgeoned state. I guess the creators thought audiences liked the incomprehensibility the best. The experience of watching the movie is not unlike untangling blinking Christmas lights while listening to all of your dishes fall out of the cupboards. Once again there are human actors stranded amidst the vehicles that turn into giant robots, but this time they can’t hold their own against the mostly-indistinguishable clanging CGI monstrosities. Where’s someone like Jon Voight or Anthony Anderson from the first movie? They both played the material with just the right amount of winking but are missing here. Why do other similarly lighthearted performers from before – John Turturro, Josh Duhamel, and Tyrese Gibson – get swallowed up by bad writing and self-importance? (Don’t even get me started on Julie White and Kevin Dunn, for whom I’m just embarrassed). Shia LaBeouf and Megan Fox are also in the movie but make so little impact – neither is given any great distinct moments – that they are hardly worth mentioning despite being the ostensible stars of the thing. The plot involves giant bad robot people who want to find this other big machine to kill humans and the giant good robot people that try to stop them, but even that, believe it or not, takes a back seat to the mindless action that’s little more than militaristic fetishism and rampant misogyny, ethnocentricity, and racism. The only thing Bay’s camera lingers on more than cleavage and explosions are the gleaming weaponry of robot and man alike. All women are either excessively emotional or cold-hearted man-killers (or maybe even robots in disguise). All scenes that take place in foreign countries showcase a startling condescension, using natives for comedic effect or background props and using the basest shorthand for displaying foreign cultures. And then there’s the matter of the two shuffling, illiterate, exaggeratedly incompetent and idiotic, jive-talking Transformers who are practically blackface robots. Need I say more? I could barely tell the robots apart, could barely understand what most of them were saying, and barely cared about the exposition that both they and the humans were force to spell out. There’s no scene to match the first film’s great comedy of the exposition that reveals the true nature of the Hoover Dam. To say that the script was written with a tin-ear would insult all the great hacks out there who use their tin-ears to competent effect. What went wrong with this script? Two of the writers are Alex Kurtzman and Roberto Orci, who have written fine popcorn flicks like the first Transformers and the great recent Star Trek. I hesitate to lay the blame with them since their record has been so spotless. What about the third credited writer, Ehren Kruger? He’s mostly written horror movies (some of them bad) but I think his influence is felt mostly in the creepy scenes of mechanical intrusions, like when LeBeouf finds himself with an itty-bitty robot crawling up his nostrils. Is the blame then to lie with Michael Bay, who supposedly did some work during the Writers’ strike? It’s possible. Or maybe the script is a result of clashing styles and tones and a rushed schedule which resulted in no ideas being thrown out? It certainly feels at times like a filmed brainstorming session. It’s a total mess. There are two kinds of Michael Bay movies: dumb fun and just dumb. Can you guess which one this is by now? The movie is everything that is wrong with big-budget sequels. It’s long, formless, and indigestible. It’s scenes of endless noisy nonsense punctuated only by more scenes of endless noisy nonsense, and then it goes on for over two-and-a-half hours. I left with nothing more than a headache. In 1974, journeyman director Joseph Sargent pumped out the lean, gritty, hijacked-subway B-movie The Taking of Pelham One Two Three, with a sardonic, sarcastic Walter Matthau going up against the crisp and creepy Robert Shaw in a battle of the wills fleshed out with eccentric supporting characters and local color with the grimy and goofy New York City (back when crime and bohemianism were high, civic pride and public services were low) a character in its own right. But that was thirty-five years ago. Now director Tony Scott has updated without besting the original concept – bringing to it his trademark restless but uncurious camera – and without finding a way to make the story relevant to how the city is today. Rather, Scott has created a movie that feels disconnected from our time and drums through its plot mechanics with a grim, unsatisfying sense of déjà vu. It’s more than the fact that it’s a remake that makes the movie feel generic. The bleary, numbing cinematography works in concert with the blandly clunking score to create a sense of tiring excitement where I felt commanded to be entertained. Denzel Washington replaces Matthau and does a fine job with a role that, as written, is less than taxing. Anyone with sufficient screen presence could have pulled it off. This is no slight against Washington, a great actor, but rather against the script by Brian Helgeland (who’s done fine work in the past). This isn’t a distinctively written character. Like most of the characters, he’s given nothing distinct or interesting to say beyond tired thriller lines that have slid out of the thriller factory like clockwork for decades. Maybe he should be grateful, for when Helgeland attempts to write something different and distinct, it ends up sounding stupid like poor John Travolta (loudly hamming it up in the Shaw role) who is forced to punctuate nearly every sentence with an ill-fitting profanity. Treated even worse are the great character actors, like Luis Guzman and John Turturro, who are given next to nothing to do, or James Gandolfini who does so well with what he’s given (the one stab at current reflection that sticks) you wish he had more, and better, things to do. Any suspense that does arise comes from the plot itself, but the inherent suspense in the story goes unexploited. The subway car is stuck underground. How will the hijackers escape? The plot’s central thrill comes from the lack of motion. The subway is gumming up the works and Matthau/Washington main goal is not saving the day, but getting things running again. But Scott doesn’t trust stillness to raise tension, nor is he interested in exploring the mundane goal of getting the subway system running. His camera zooms and spins in a desperate attempt to whip up extra tension but instead spins further and further away from tension. The Hangover is the kind of effortlessly entertaining, explosively inappropriate, R-rated summer comedy that provides plenty of laughs and then leaves without a trace. There are no quotable lines or priceless moments that will last much past seeing the thing, but it’s plenty of fun in the moment. It doesn’t hurt that it has a fun premise. 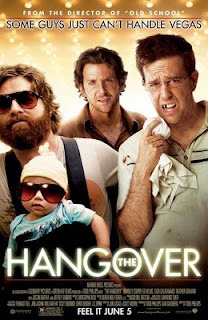 Three guys take their friend (Justin Bartha) to Vegas for his bachelor party only to wake up the next morning to find that they have no memory of the night before and have lost the groom. It’s a great hook, sending the three guys through Vegas on a desperate search for their friend, along the way running in to all kinds of strange characters that reveal pieces of the puzzle of their night. It doesn’t hurt that the three guys are played by very funny actors embodying specific types of modern male dysfunction. There’s Bradley Cooper, handsome, fun-loving, and rebelling against middle-class married-life suburbia, a real Fight-Club type. There’s Ed Helms, a gangly, nerdy, cautious dentist, under the thumb of a suspicious, bossy girlfriend. Then there’s Zach Galifianakis, the loopiest, goofiest of the bunch. His face is hidden behind a Grizzly-Adams beard. His belly folds over his belt. His eyes are often hidden behind large sunglasses or a dazed glaze. He’s awkward and uncomfortable to watch but completely funny in the way he delivers the strangest lines (he has to be back in town for the Jonas Brothers concert and must stay 200 yards from all Chuck-E-Cheeses). The three guys tear through town running into a baby, a tiger, a stripper, cops, doctors, gangsters and even Mike Tyson in their search for their friend and to find out what, exactly caused the mayhem they discover. Why is a mattress speared on a statue? How’d they get that car? Whose baby is that? Who ordered those custom mugs and hats? What’s that chicken doing? Dude, where's our car? The movie has no weight – I never really cared about the characters – but there’s enough humor and hot air to float the movie to the finish line, even if it starts to deflate a bit in the third act. Even though I didn’t care about the people, they were still likeable creations, and there’s enough curiosity factor to each new development – how’ll they get out of this? – to sustain the freewheeling energy for most of the time. Director Todd Phillips has a fine cast (including support from Jeffery Tambor, Heather Graham, Rob Riggle, Mike Epps, and Ken Jeong) and uses them well. He also knows his way around the dude humor of the concept, building on his past experiences with Old School and the like. Phillips guides the movie with a steady, sure hand, knowing when to punch up the humor and knowing when to keep it low-key. This isn’t going to be an especially memorable picture – its effect is already wearing off and I’ll have mostly forgotten it within a year or two – but it’s sure to be a staple of late-night TV. A year ago, the film community had almost forgotten about Speed Racer, caring only about its box office failure and the horrible critical consensus. I, on the other hand, loved it and took comfort in finding that Dennis Cozzalio, Richard Corliss, and Rob Humanick shared my enthusiasm. The film ended up on all four of our lists of favorite movies for 2008 (Cozzalio: #1, Corliss: #9, Humanick: #2) but it will take some time for the cult of Speed Racer to grow. Allow me to add another voice to the choir singing the praises of this film that was so unfairly beaten up and left for dead. This is a future cult classic. Like most little boys, I loved Saturday morning cartoons, the louder, the flashier, the more action-packed the better. Sure, the quieter, funnier ones were great but they failed to occupy the same fever-dream intensity in the imagination that boiled them out onto the playground. The genius of the Wachowski Brothers’ film adaptation of the early pre-anime series Speed Racer is in its effortless capturing of those feelings. The film is a big, over-the-top, live-action cartoon, and unapologetically so. The film is a wide-eyed digital creation, a film of non-stop action and intense gumball colors that pop and blur and burn their ways across the screen. It’s every boy’s cartoon-fueled fantasy filmed and thrown onto the screen. It’s fitting that the film opens with a young Speed Racer sitting in class daydreaming about being a racecar driver. The classroom melts away into a childish doodle of a race that soon slides into the most remarkably dense and layered opening sequence of any film this year with three flashbacks simultaneously unfolding. It’s smart of the Wachowskis to throw us right into a race-sequence (two of the flashbacks are races). As fun as the film is, when the cars take off down the track the movie becomes a flashing, spinning, kaleidoscopic, neon pinball machine. These exciting races are not only inspired by the original show’s early-anime aesthetic but seem equally inspired by Hot Wheels, “Mario Kart,” and “Wacky Races” while still seeming radically original in execution and style. The look is, in influences, part futuristic, part retro, but all cartoon. The races take up a good portion of the film but the plot itself is a topsy-turvy speed through all kinds of cartoon clichés which are invigorated by the pitch-perfect cartoonish performances by all involved. All of the performers know exactly the kind of movie they are in and acts accordingly. Emile Hirsch hits just the right notes of earnest naiveté as Speed Racer who races in the shadow of his older brother who was killed racing years before. His father (a perfectly paternal John Goodman) and mother (Susan Sarandon bringing just enough maternal warmth) support him, as does his younger brother (Paulie Litt, the right amount of annoying). They’re a family right out of the 1950’s but the villains are right out of a mid-80’s cartoon: a nefarious head of a corporation (Roger Allam) with a troupe of slimy henchmen out to fix the race. While on the subject of performances and casting, why don’t we pause to marvel at Christina Ricci (playing Trixi, Speed’s girlfriend), who, through a combination of costuming, hairstyling, makeup and genetics has the perfect look of a cartoon heroine with her big, wide eyes. This is an overstuffed and over-the-top film with moneys, ninjas, piranhas, cars, trucks, booby traps, throwing stars, and machine guns but the Wachowskis never seem to be operating with a checklist of cartoon staples and stereotypes. Even moments as bizarre as a monkey, drunk on candy, driving a vehicle and rocking out to Lynyrd Skynyrd almost, no, definitely, make sense in context. All sorts of puns and slapstick that, in any other setting, would have no reason to be funny work surprisingly well. I had to laugh with glee when, in the middle of the race, while still in their cars, one racer punches another in the face. As with anything radically original, there will be those resistant to its charms. Don’t listen to them. This is truly a film that has to be seen to be believed. A decade ago, Andy and Larry Wachowski made the genre-busting, envelope pushing special-effects picture The Matrix, a film the ramifications of which are still being felt in the genre. Blockbusters still ape the color palate and every action film slightly out of the ordinary can count on finding someone to call it “the next Matrix.” Now, with Speed Racer, the Wachowskis, dare I say it, have bested themselves. They have created a heart-pounding action-adventure family film that’s such a radical and successful fusion of style and content that it’s nearly impossible to copy. This is uniquely exhilarating, startlingly vivid filmmaking that creates a delirious candy-coated kaleidoscope of colors that swirl and mix to make up this live-action cartoon that is a persistent and immersive world that exists only in the realm of the imagination. The fluid, dynamic and expressive score from Michael Giacchino, in concert with the sensational sound editing, work overtime to keep the ears as dazzled as the eyes; the technicians are more than successful. Yes, the film can at times be overwhelming, threatening sensory overload, but it’s the same effect cartoons can have on kids. This is terrific entertainment, not just for its technical achievement but because it had me stumble exhilarated from the theater pulse-pounding, blinking the colors from my eyes, and with a smile so wide it hurt my face. Revolutionary Road is now available on DVD and Blu-ray. Since 1961, when Richard Yates’ great novel Revolutionary Road was published, it has become thoroughly frequent to see “daring” artists scrape at the layers of happiness covering both suburbia and the 1950s and 60s to find the hopelessness and emptiness within. The biggest danger in adapting the book to film now is in failing to making what was original exciting once more. Director Sam Mendes fails for the most part. This is fairly routine stuff at times. The book’s greatest strength is its fluid prose which floats through character’s heads. We see motivation and emotion effortlessly woven and incorporated into character’s actions. As good as Leonardo DiCaprio and Kate Winslet are as performers, they don’t manage to convey the same intensity of purpose. For all the great histrionics of their acting they don’t dig into the roles. Here they become examples of Age-Appropriate-Dialogue-Delivery Devices, to use the astute nomenclature of the great Sam Van Hallgren. But there are moments of visual perfection: a sea of top hats flowing into a subway station, a group of children staring at the television unaware of their father’s voice. But for every scene of effortless emotional twinge that the pictoral vision can evoke, even great early moments like the one that finds DiCaprio returning home from an affair in the city to be greeted by his children was done better by the TV show Mad Men. A curious thing about the movie, though, is that, although it starts by sputtering its engine, once it roars to life it has a pretty good roar. The roar is due, in no small part, to the great supporting cast. David Harbour and Kathryn Hahn are perfect as a middle-class post-war all-American couple slowly colliding with the façade of the suburbs. Maybe they should have been the leads. But knocking everyone else in the cast out of the ballpark are Michael Shannon and Kathy Bates who are operating on another level altogether. They know just the way the material should be handled. Why didn’t anyone else (other than Harbour and Hahn) catch on? Even if the movie doesn’t, maybe even couldn’t, have the same wallop as the novel, the end still manages to deliver its plot twist with a satisfyingly sickening crunch – a sort of sick cinematic flip to the saccharine sacrifice that caps Kate and Leo’s Titanic. The extent that it does work I found a little surprising considering pessimism is much more relatable from the inside out and Mendes keeps the film firmly entrenched on the outside.